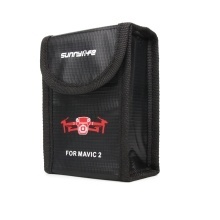 This high quality bag is suitable for Mavic 2 Pro & Mavic 2 Zoom drone, with an eye-catching appearance and fashionable design it easily standout and distinguish from other bags. Explosion-proof material ensure the safety of your drone, great choice to take your drone out. The surface material is water-proof, dust-proof and easy to clean. Explosion-proof material ensure the safety of your drone. Design hand-pack design, easy and convenient to carry.